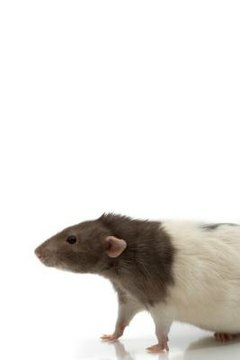 Rats are intelligent, curious creatures that make excellent pets for people looking for gentle rodent companions. With the responsibility of rat ownership comes the need for a balanced diet and a continuous supply of fresh water. Water bottles can harbor bacteria, dust and debris. To keep a pet rat healthy, fresh water should be available at all times. Water is essential for all pets to avoid dehydration. It helps to digest food, regulate body temperature and eliminate waste. Rats gain water from the foods they eat and from the action of drinking water. Pet rats depend on humans to take care of their basic needs, including a steady flow of clean water. Providing your pet with fresh water daily can help increase his lifespan and prevent hazardous contaminants from making him sick. The average daily water intake is approximately 10 milliliters per 100 grams body weight for the average adult rat, according to The People’s Dispensary for Sick Animals. This is about 2 ounces of water per day for the average-sized rat. Rats should be given water from a water bottle equipped with a metal sipper tube. The tube should be positioned low in the cage to allow easy access to water. You should empty your pet's water bottle, clean it with warm water and soap, and refill it with fresh water at least once a day. While a fresh water-filled bottle should be attached to the side of your rat’s cage at all times, rats can also obtain a water source through the foods they eat. Offer your rat small amounts of fresh fruits and vegetables daily, the ASPCA recommends. Apples, bananas, peas and broccoli are ideal starter foods. Never give your pet rat any other type of fluid, including caffeinated or carbonated beverages. Drinking too much or not enough water could indicate a medical condition. If this continues, make an appointment to see your vet. Certain things could make a rat more likely to drink, such as flavoring in the water. Offering your rat moist fruits and vegetables daily could make him less likely to drink water. Common signs of illness in rats include diarrhea, weight loss, lethargy, sneezing, dull eyes or difficulty breathing. Since water is a vital requirement in your rat’s daily diet, don’t wait to bring your pet to the vet if he refuses to drink. Can Pet Rats Eat Hard Boiled Eggs?